Dragon’s Domain Records, to be distributed through buysoundtrax.com, presents THE MARK SNOW COLLECTION, VOLUME 1, featuring two superlative orchestral scores composed by Mark Snow (THE X FILES, SMALLVILLE, GHOST WHISPERER) for select television movies from the 1990s. The first, THE LITTLE KIDNAPPERS, is a remake of a family drama set in northeastern Canada; the second, SMOKE JUMPERS, is based on a true story, a portrait of heroism and sacrifice in the midst of a deadly Colorado wildfire. Both scores show how Mark Snow can wield an energetic orchestra and an exceptional melody into an effective and dramatic piece of film music storytelling. 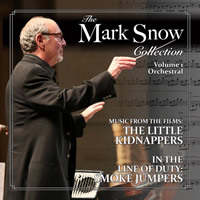 Dragon’s Domain Records, to be distributed through buysoundtrax.com, presents THE MARK SNOW COLLECTION, VOLUME 1, featuring the original television soundtracks to THE LITTLE KIDNAPPERS and SMOKE JUMPERS, featuring music composed by Mark Snow. THE MARK SNOW COLLECTION, VOLUME 1 is a limited edition release of 500 units. The first 50 units sold through the website will include a booklet autographed by the composer. Ships the week of November 20th.